The cities of New York and Los Angeles have been the backdrop for countless movies, with their iconic skylines lit up on the big screen. But the look that has inspired generations of directors is about to be changed for good as LED street lighting is brought in. The switch to LED lighting means Los Angeles will save at least $7 million in electricity bills each year. The signature urban glow captured by director Michael Mann has been replaced with a more clinical-looking shine after LA replaced more than 140,000 street lamps with LED lighting. New York and several American cities are following suit, while in Britain areas of Manchester, London and Glasgow already have some LEDs installed. Director Michael Mann had experimented with HD cameras during the making of the Tom Cruise thriller in 2004, as he tried to capture the essence of the city at night. Lamps made from light emitting diodes – LEDs – are essentially filled with tiny light bulbs that, unlike traditional ones, don’t have filaments that can burn out. LEDs have a far longer life that regular bulbs, outshining them by thousands of hours. However, some have an incomplete color spectrum, affecting how objects bathed in the light appear. Filmmakers already know how to compensate for changes in artificial light, but the spectrum of LEDs will create new challenges. Another big change is that LED lamps shine white, which is great for night driving but not so useful if you are trying to shoot moody scenes like the ones in Collateral. 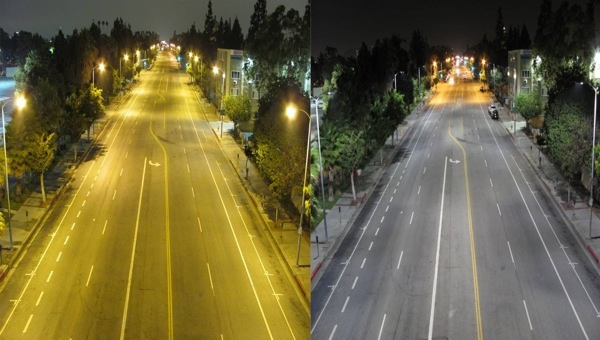 By switching to LED street lamps, Los Angeles and New York City will save $7 million and $14 million a year respectively.